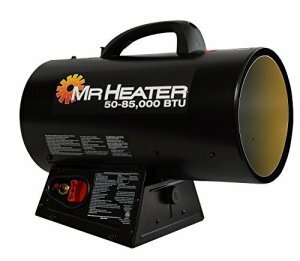 This Mr. Heater Portable Propane Forced Air Heater safely produces 50,000 to 85,000 BTU of instant clean burning heat for up to 2,000 square feet. This heater is constructed with rugged durable steel that is ideal for construction sites, workshops, remodeling jobs, agricultural buildings and repair shops. Mr. Heater portable propane forced air heater comes equipped with a L.P Gas Hose and regulator and offers a wide stance base construction. Mr. Heater Portable Propane Forced Air Heater is designed with quiet burner technology making it 50% quieter than equivalent BTU heaters.